PART 3 of a 5 PART Post >> Go to first post >> Read this Free Fantasy eBook Online or Download in an eReader format of your choice. Astrid carefully placed her boots over the frozen ground, hoping her footfalls would not be detected as she slunk along the edge of the creek bed. Early morning left a coating of hoarfrost on the branches that stuck up from the banks of the ice covered waters. The young woman slid around the dormant bushes so as not to disturb the delicate patterns of frost, while she hunted for enough cover to execute an ambush. Balin would come for her soon, and she needed to be prepared. The thunder of Balin’s voice startled Astrid. Even though she realized her mother’s warrior hunted her, she did not expect him so soon. Her skin quivered underneath the layers of her mantle and tunic. She tensed, stopping in her tracks, holding herself still. Astrid maneuvered closer to the creekside underbrush, seeking the concealment of the nearby thicket. Once positioned with adequate shelter, she crouched. She had hoped to reach higher ground for her standoff. Instead, she huddled a few paces down from the level of the field, spying over the edge of the bank into the wintry landscape above, searching for movement. The predawn light washed the starkness of the land in a lavender hue. A blanket of mist obscured long patches of ground, settling across a meadow that extended toward her makeshift home. Vapor clung in the dip of the creek bed, providing more camouflage. Astrid hoped it would be enough to gain the advantage lost by the inferior placement in her surroundings. Balin’s bulk appeared out of the mist, a giant of a man with a battle sword drawn and ready. The sheer mass of him was enough to cow even a war hardened soldier. As tall as Astrid stood for a woman, she was, nevertheless, an ill match—in both size and experience—against her mother’s chosen guardian. He knows where I am. A rush of blood shot into Astrid’s limbs. She reached for her sword, feeling the cold, hard iron press against her palm. With a singular movement, she released the blade from its cover. “I can hear the ring of your metal!” Balin pointed his massive sword in her direction, gripping the hilt with both hands; he rumbled across the ground toward her like a landslide of boulders. I have betrayed my position. 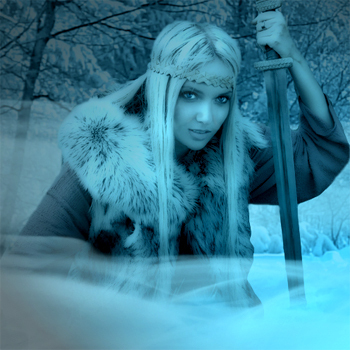 Astrid scrambled up the bank, flattening herself against the snow laden earth, hoping the whiteness of her hair and skin would blend with the mist and hide her from the warrior’s sight. She slithered on her belly away from the oncoming earthquake of Balin, making a wide circle around him. She sprang to her feet and crept to his backside, training the tip of her blade at the back of his neck. The man’s constant jabber rattled her. Astrid knew it was meant to, but she did not share the same advantage. Silence was her only option. Silent from birth, her voice had never once sounded—not even a hum, a sigh of happiness, or a cry for help. The words she spoke remained locked in her own mind. Those thoughts fired up from her depths and fueled her fury toward Balin. She pressed forward, into the warrior’s guard, forcing him to step backward in order to meet her blow. This is for the time you hunted me down, dragged me home, and stole my only chance at friendship. Astrid struck at the warrior, remembering the young villager who had wandered into a remote meadow near their encampment. The girl had befriended her and invited her back to her family’s farm on the far side of the valley. When her mother and Balin found Astrid, the brute threw her over his shoulder like a sack of grain and carried her off. They dismantled their home after her indiscretion with the outsider and moved yet again, deeper into the Scandian wilderness and away from the prying eyes of strangers. Balin blocked her blow, and Astrid thrust again. How could the companionship of one little girl have caused us harm? The clang of iron against iron spoiled the morning’s quietude as the two jabbed and lunged. Do you know what it’s like? Being so alone? “I sense anger in your swing.” Balin said with a laugh. Of course, you don’t. You have my mother. You follow her like a dog. As if to prove his point, Balin’s next strike sent a tremor through Astrid’s body. Her muscles gelled inside her skin as she struggled to meet his blow. She pushed back, but could not match him. Instead, she released, rolling to one side as the warrior’s sword sliced into the snow. She continued to spin into a crouch, using the force of the momentum to thwack the blunt side of her sword against the back of Balin’s knees. The warrior buckled and crashed downward, catching himself with his free hand. He scooped a mound of snow into his fist. At least I can enter the shadowwalk to ease my loneliness, and you cannot block me. Guilt seized her at the thought of the forbidden power, and she hesitated, losing sight of her surroundings for a moment. A shower of snow hit her face, blinding her. She heard Balin grunt as he moved. Astrid reached up to rub the freezing wet powder from her eyes, but when her vision cleared Balin was nowhere to be seen. She spun, but something whacked her across the middle of her back, sending her flying. The force of the blow knocked her several paces forward, plunging her into the snow. Her face met the bite of frost as she fell flat on the ground. A chill spread through her. She spat flurries from her mouth, struggling to get upright. The frigid tip of Balin’s blade pinched the side of her neck, pressing her back down. Caught, she allowed herself to be guided by his sword as she turned on her back and looked up at the bear of a man. His bulk hunkered over her as his breath joined the nip of the morning breeze. Every muscle under her skin tensed. The warrior pulled his sword upward, as if to gain impetus for the drive through Astrid’s skull. She watched the metal recede, transfixed as the sun’s rays caught the iron, casting beams of light upon her. Balin drove the sword downward. Astrid held still, denying the desire to flinch; she refused to acknowledge the man or his weapon. The sunbeams blurred as the warrior spiked the tip of his blade into the ground—a hair’s width from Astrid’s head. “Enough sword practice for today.” The warrior extended his hand to help her up. Astrid ignored his outstretched arm and sprung to her feet, dusting the whiteness from her mantle and trousers. The familiar pang of tightness formed in Astrid’s throat. She clenched her jaw and turned away. All my complaints unheard, all my frustrations remain, and Balin tells me to forget them and focus on an imaginary fight. The warrior gripped her shoulder. Astrid sloughed off his touch and stalked off. The frigid air whipped around her, causing her long ice-white hair to lift from her mantle and extend into the wind as if reaching for the comfort of another human being. But none would be found. None ever were, except within the shadowwalk, which she knew was forbidden. For as long as she could remember, her mother and the warrior had been her only companions. Others were not permitted in her presence. She bristled at his compliment, continuing toward the huff of wood smoke smudging the horizon. Astrid sheathed her sword as she marched. Their hut appeared in the distance, a vague outline in the morning’s mist. The pain in her throat increased as she approached. I’d rather wrestle a wolverine than battle through one of my mother’s lessons.